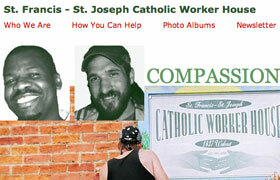 The St. Francis - St. Joseph Catholic Worker House is an emergency shelter for homeless men in downtown Cincinnati widely know for its above average success rate for rehabilitation and employment. With simplicity in mind, we focused on the quality of the text and designed an extremely simple site wrapped in a warm and inviting green and red color palette and an easy to read sans serif font. Even the set of photo albums use basic back/forward buttons, and next to the Donate button, the site describes what is needed by way of contributions and volunteers. Future plans are to redesign the website to make it responsive on all devices.